One of the few churches in Scotland to survive the Protestant Reformation without being destroyed, is the impressive Glasgow Cathedral. 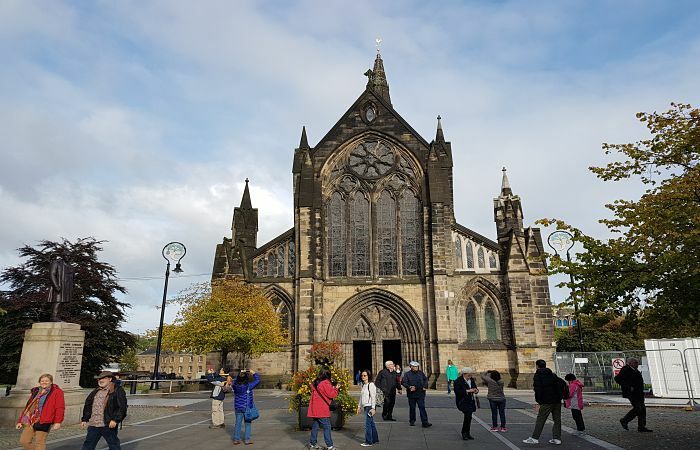 In Scotland, round about AD550, St Mungo, the first Bishop of the British Kingdom of Strathclyde, founded a religious community around a small church, in an area that was to become known as the city of Glasgow. The present stone building was built in the 13th century, on the site where He is believed to have been buried in AD612. St Mungo’s tomb is located in the present building and there are also fragments of an old 13th century shrine to the Saint. Today it is Scotland’s most important thirteenth-century building and one of the most impressive structures. As recent as the 20th century the area surrounding it was improved with the construction of a new visitor centre. Located about a mile to the east of George Square, the Cathedral has one of the finest post-war collections of stained-glass windows in Britain. Anyone visiting Glasgow Cathedral will be impressed with the stunning architecture and history. Just behind the Cathedral is the city’s graveyard, known as the Necropolis, and to the west side is the oldest house in Glasgow, “Provand’s Lordship”. The title deeds of the house dates from 1562 when Mary Queen of Scots granted the lands of Provand to William Baillie, a canon of the Cathedral. It’s referred to as a Cathedral, but there’s no bishop, in keeping with the presbyterian constitution of the Church of Scotland. It has a regular, active congregation, and if you are in Glasgow, you should not leave without visiting this magnificent building. It received a huge compliment in 1451, when the Pope declared that a pilgrimage to Glasgow Cathedral would carry the same standing as a pilgrimage to Rome. The Cathedral is perhaps not as well known as it should be, and that’s a great pity. Maybe it fades into the background somewhat, in the shadows of some of Glasgow’s many other great attractions, but it’s certainly worth visiting if you’re in the city. Check Opening Times – Admission is free at the time of writing, but Historic Scotland are considering introducing an admission charge.